Senate Majority Leader Mitch McConnell, R-Ky., walks to a meeting in the U.S. Capitol ahead of the Senate vote to open debate on health care. The Senate voted Tuesday to begin debating a replacement for the Affordable Care Act. It remains uncertain as to what that replacement might look like. No formal legislation has been drafted. 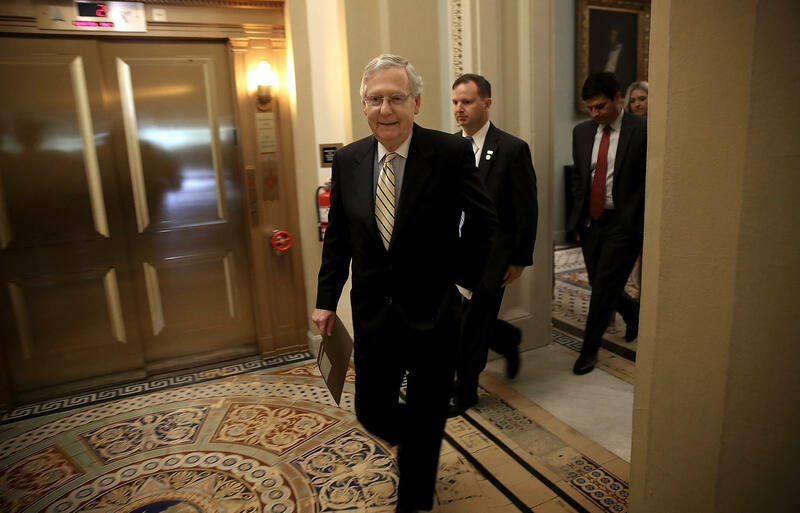 But senators moved to take the procedural first step, known as a "motion to proceed." The vote was 51-50, with Vice President Pence casting the tiebreaking vote. Debate will now begin, most likely on a measure to fully repeal the law, also known as Obamacare. With all Democrats opposing the measure, Senate Republican Leader Mitch McConnell could afford only to lose two votes from his 52-vote majority and two GOP senators did vote no, Maine's Susan Collins and Alaska's Lisa Murkowski. There was more drama. The vote marked the return of Sen. John McCain, the Arizona Republican whose brain cancer diagnosis stunned his colleagues. He was greeted with a standing ovation on the Senate floor and was embraced by senators from both sides of the aisle. McCain then voted yes on the motion. President Trump, speaking at a news conference with Lebanese Prime Minister Saad al-Hariri in the Rose Garden, pronounced himself "extremely happy" and predicted, "We're going to come up with a plan that's really, really wonderful for the American people." He also thanked McCain for coming for the vote. Before voting began, a group of protesters shouted "kill the bill'" and "shame" from the Senate's galleries. With debate formally opened, senators will be able to freely offer amendments, so nobody knows what the final product will look like. It's an unusual and perhaps unprecedented way to draft a bill that will affect millions of Americans and a large chunk of the economy, to say the least. But McConnell said after the vote that "we'll finish at the end of the week."